We’ve asked authors of books with reviews in the upcoming issue of the Oral History Review to answer 5 questions about why we should read them. In our latest installment of the series, sociologist Robert Gay discusses Bruno: Conversations with a Brazilian Drug Dealer. 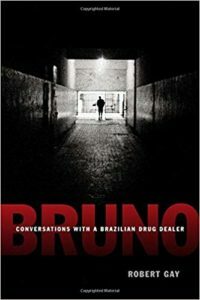 Matthew Barr’s review of Bruno: Conversations with a Brazilian Drug Dealer is currently available online. My book tells the story of a young man who, in the early 1980s, became involved with the Brazilian drug trade. Posted to the border with Bolivia, he took advantage of his role as a corporal in the Brazilian Navy to supply cocaine to Rio de Janeiro’s favelas which were increasingly under the control of a criminal organization known as the Comando Vermelho (CV). Eight years into his career as a trafficker, he was arrested in Rio and sent to a civilian prison where he joined the CV and emerged as one of its leaders. Information about the internal structure of gangs and their uncontested control of the prison system is extremely hard to come by. Fortunately, I was able to access this information as a product of what is now over thirty years of continuous fieldwork in the favelas. Bruno: Conversations with a Brazilian Drug Dealer. Robert Gay. Durham ; London: Duke University Press Books, 2015. The book is essentially a recorded conversation between me and “Bruno” that I conducted over the course of seven visits to Rio between January 2007 and March 2008. I first met Bruno in 1999, a few days after he was released from prison. It wasn’t until seven years later, however, after we had become friends, that he literally turned to me one day and said, “I’m ready to tell my story,”—a story he hadn’t told anyone and that was tearing him up inside. This is the second book I have written using this approach, which I love, because it brings what is hopefully a compelling and revealing story to life! I have no training as an oral historian and, to be honest, had little or no experience going in. At a certain point in my career, however, I grew tired of writing up my research in the usual dry, third-person, social scientific format. So, I tried my hand at storytelling and have never looked back! Since I am not one, I have no idea! Seriously though, I hope that oral historians will appreciate the conversational style of the book. In most oral histories that I have read, the interviewer’s voice is silent. I decided to include mine to give the reader a sense of how the story unfolded and the nature of the relationship between Bruno and me. It’s not everyone’s cup of tea but it’s a technique that has become more common. I want readers to come away with an appreciation of how complicated the situation in Rio specifically and Brazil more generally has become. And how the policy decisions, made by the authorities, end up making things much worse. Drug gangs and the criminal organizations that coordinate their activities are the direct result of decades of state repression and neglect of low-income communities. Sadly, however, the policy response is always the same: more repression and more neglect.